When we live frugally, day after day, there is the chance we'll slip into the poverty mindset. We scrimp and save so much that we lose a sense of who we really are, and why we are choosing to be frugal. Our children ask us to buy something for them and we reply, "I'm sorry honey, we can't afford that." As a result, our children go through their day feeling poor. I hear myself say constantly, "that's not within our budget" (which I think is only slightly better than "we can't afford it"). It would be more accurate for me to reply, "we're choosing to spend our money in a different way this month." So, how do we keep from falling into the poverty mindset? Just because I'm frugal, it doesn't mean I have to look like a bag lady. My daughters wanted me to drive them up to the area with the vintage and antique shops. So we decided to make a day of it. I knew we needed to stay on budget for the day, so I planned a hearty midday snack of coffee, cocoa (it was a cold and drizzly morning here), vegetarian burritos (leftovers from last night's dinner), and bananas. I could've piled all this stuff into a plastic grocery bag, in fact that would have been the quickest route. 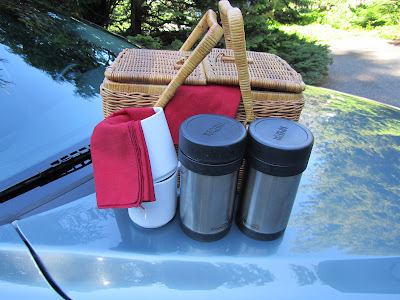 Instead, I took 5 minutes to get out my small, nearly 30-year old picnic basket, and packed the thermoses and our snacks inside. Lacking paper napkins, I tossed 3 cloth ones in the basket, along with some non-breakable mugs, and a rag for spills. After a couple of hours of shopping, we were a bit chilled and hungry, so off we went for our car picnic. Had it been a warm day, it would've been pleasant to sit on a bench outside, but it was still cool. We were content to have our midday repast in the car. And none of us were thinking, "gee it sure would be nice to be eating in one of those restaurants." I think our enjoyment of the moment came because we had made the effort to "do it well". It wasn't fancy schmancy stuff. But it was definitely a cut above a plastic shopping bag and paper towels. What was I waiting for, a visit from the Queen? We all have some nice belongings. Yet we keep them stored away, awaiting that royal visit, perhaps? How often do you treat yourself to the little niceties that you've acquired along the way? My grandmother lived on a very small income for most of her life. But I never knew that. She used her silver and china everyday. She laid her table with linen cloths handed down from her mother. Paper napkins were reserved for untidy toddlers. Even her kitchen waste bin was a very pretty basket. She wasn't trying to impress anyone. She just wanted to enjoy the use of her finest things. I recently found a box of towels stored away in a closet. These are very nice, monogrammed bath towels that had been wedding gifts, 25 years ago. We never used them because, "we might get them dirty". Silly us, that's what towels do, and that's why washing machines are so great! Needless to say, I brought those towels out and am using them everyday, now. Cutting flowers and bringing them inside to enjoy, is another way to bring beauty and a sense of luxury into an otherwise ordinary day. I've amassed a variety of vases to put them in. When I have my mid-morning coffee or tea, I sometimes put it on a nice little tray. It's pretty, I enjoy looking at it, and it says to myself, "I'm taking care of me." We use cloth napkins, in part because they save money, but also because they just feel and look nice. Keeping these belongings in convenient access locations, I find that I'm more inclined to use them. And I know that I don't have to pull out all the stops everyday. If I just do one of these things daily, it enhances my mindset. So, when you go out, do you look like a bag lady, or do you try to live frugally with flair? We just took a road trip and carried all our snacks in a basket. We carried along cups of water. (It's hot here!) Daughter and I had a great time making the snacks, we knew what every ingredient was, and we kept our costs to a minimum. A win, win all the way around. Love the idea of the thermos -- when our last one bit the dust I never replaced it, but I will start keeping an eye out for a replacement. Hot cocoa during our winter months would be ideal! Hi Shara, it sounds like you and your daughter did a great job with the snacks for your road trip! And you used a basket!Yea! My kind of woman! I find that if I don't plan something for snacks, then it's usually me who will say, "lets stop and get something". For our day trip, it was the coffee that got me started to think about a whole lunch. I knew that I'd smell Starbucks or some other coffee house coffee, and really want some too. And folks always say it's the kids who whine! I see large thermoses at garage sales fairly often, and Target usually has a good selection on sale beginning in August. Thanks for leaving a comment! How cute! And I can definitely see how using real china teacups would not appeal much to a boy! I keep thinking that I'd like us to use our dining room more. It seems to be reserved for holidays and birthdays. I just think it might be nice for us to not eat in the kitchen for a change. I'll have to keep working on that idea. What a wonderful mentality! I'm the same way- I choose to splurge on things that are important to me and do my best to keep expenses quite low in other areas. Sometimes it's easy to fall from "I am choosing not to spend on X because I am prioritizing Y" to "I can't afford anything!" The idea of using your nice belongings to make ordinary moments special is beautiful. I often let things like my cute canvas picnic basket sit in the closet because it's easier to grab a grocery bag, but why do I own them if I won't use them? Thank you for the inspiration! I find I have to remind myself, often, that I'm choosing to live my life a certain way. It is just so easy to look around, see friends spending money senselessly, and forget my goals and priorities. Taking care of myself with little luxuries that cost nothing (like using the nice things I already have), really helps me stay on track with goals, and not feel deprived. The other day, I did have a tiny debate in my head "do I reach up onto the top shelf for the picnic basket, or just grab a plastic grocery bag that's here right close". It's funny that my first thought isn't "ooh, we get to use the picnic basket!". I'll have to work on that. Thanks for your comment. What a beautiful view of frugality! I have to try to incorporate some f that into my day... especially about the 'choosing to use our money...' comment. It is very difficult not to become bogged down with all the 'stress' of saving/frugality, but your column works wonders for my psyche! Keep up the good work! Thank you! It is stress-inducing, isn't it, to always be so careful with spending. I have found that doing creative frugal things, whether it's rearranging the furniture to get a new look to a room, to turning a pair of jeans into summer capris,(for nothing more that the cost of thread), to making gifts, to using the nice things we already own -- doing these things all keep me from getting bogged down in the pennies and dimes of saving money. And the constant reminding myself, that we are making choices with our money, is freeing. It puts me back in control of our money and not our money controlling me. I really enjoyed reading this post. Living frugally with flair is something I need to work on a little more. It is so easy to get bogged down with the everyday stresses of living on a tight budget that we do end up feeling poor instead of frugal. Your post reminded me of a couple of things I've experienced. The first is many sleepovers I had at a cousin's house as a child. My aunt chose to be a stay at home mom and as a result they didn't have as much money as my family since my mom worked outside the home. My cousin's house was so much fun. My aunt put so much imagination into activities for us. She encouraged us to pretend to be camping out while we slept in sleeping bags on the living room floor. In the summer, we camped out in tents in their backyard. We even roasted hotdogs and marshmallows and told ghost stories. My aunt had a set of red dishes that she would use some mornings. She would have us pretend that we were at a restaurant and 'order' breakfast. I always loved spending time there. Even though they didn't have a lot of money or material things, they had so much fun. Sadly, my mom was always too exhausted from working all day to be creative...she showed us lots of love and took care of us well though! :) It's just that given the choice as a child, I would have chosen to have my mom home than to have the nicer/more material things. Your comments are especially hitting me hard--a 6 year old boy in our community died recently, and I found out today that I know his mom (I didn't know her last name so I didn't realize it was her son who passed away)--here's the thing--LIFE IS SHORT! We don't know HOW short it may be. This was a freak accident that happened to a very healthy child. Let's enjoy our families, our friends, our possessions. They are gifts to us from the ultimate Parent. That's tragic. Losing a loved one is always hard, but to lose a child would be unbearable. We had a similar story affect our family recently. A college friend of my brother's (a young father and husband, about to go an a second honeymoon with his lovely wife), was the victim of a stray bullet, here in the central district of Seattle about a month ago. It's just so sad to hear of these occurrences, and a reminder of how short life on earth is. We shouldn't save our love, time or things for some other day. As for frugality, "can't see the forest through the trees," is what my mom would say. This was a reminder to not get so bogged down in the details of life, but to see the bigger picture. The day in, day out, money saving details are the trees, and my overall goals are the forest. My ultimate goals, are to serve God, and to live a life well-lived. For me a life well-lived means being selective. Society says we should want X, but maybe what I want is Y. And in my experience Y is usually easier, cheaper and more fun than X. Staying home with my kids meant I was less-stressed, didn't have to rush in the AMs, as I would if I was working outside the home. I found many ways to make this not only affordable, but really in a sense, profitable -- we always could save quite a bit even on a small income due to our frugal choices. I have had so much fun, because of all the freedom I have to be creative. And I am so glad that I've spent my time, love and energy the way that I have. I'm actually grateful for God giving me the chance to be frugal. Now that's a mind-shift from what our culture says we should feel! Anyways, thanks to both of you for wonderful comments. Yours is the first blog I check because I think we have a very similar mindset! Love and serve God, family, and others. Have some fun along the way. I so much appreciated your comments about similar struggles with returning to the workforce, working too many hours and being exhausted. Yup. Tired and irritable moms make for a poor family life. Better to control my cash flow and spend more days at the beach. Thank you, Kris. I agree, our life priorities are definitely in sync! There's the old quote, "if Mom ain't happy, ain't nobody's happy". Poor grammar aside, there's a lot of truth to that. Our kids really need moms who are uplifting and joyful. And that's one of the ways we serve God, I think. I appreciate your input. Thanks for commenting. I always use my pretty and special things even though I am as poor as a church mouse. In some ways, a person would never guess at my lack of money. I always use cloth napkins, sometimes my good china, flowers in the house when allergies allow...just little things that say I care about me. A late friend was always intrigued by the basket of goodies I carried in the car even if we only drove an hour away. It saved buying food and starving on the trip. I am a grazer, so it is so me to have lots of choices at all times in the car. That is so wonderful, Linda! I like hearing that other folks are using their lovely things. I do need to get outside and cut some flowers. I can see some beautiful roses in the yard just begging to be brought inside. You know, I had never really thought about this, but my grandmother always had snacks in her purse. Licorice, a pack of crackers, that sort of thing. As a kid, I think I just thought that she liked licorice and crackers, so wanted to have them with her. But really I think it was just as you do, to save money on buying snacks. I think it is such a sensible thing to do. Even if I just bring a piece of fruit with me, not only will it save some money, but it would be a much better quality snack than the fast food/convenience store junk.